Russia arranges supplies of red caviar from the United States. Wholesale prices for red caviar — which skyrocketed by 70 percent this summer due to a poor start to the salmon fishing season — have returned to their former levels and may decline even further. Several processors have purchased nearly 1,500 tons of frozen caviar in the U.S., offering it on the Moscow wholesale market for 800-900 rubles ($25–28) per kilogram, at an average cost of 1,200–1,300 rubles ($37–40) per kilogram. At the end of September, the average wholesale price of red caviar in Kamchatka was recorded at 1,500–1,700 rubles ($46.50–52.50) per kilogram, the Federal Fisheries Agency Rosrybolovstvo and the Union of Industrialists and Entrepreneurs of Kamchatka reported. “The cost of caviar has almost returned to its former level. Total growth did not top 10 percent,” said Rosrybolovstvo press secretary Alexander Saveliyev. On June 22, due to a poor start to the salmon fishing season, wholesale prices for red caviar in the Kamchatka territory (where around 40–60 percent of caviar is produced) soared by almost 70 percent, to 2,100–2,500 rubles ($65–77) per kilogram. “The salmon catch had risen by the middle of the fishing season, and now it has come close to 400,000 tons. Approximately 15,000–16,000 tons of caviar will come to market — enough to satisfy domestic demand,” Saveliyev said, explaining the reasons behind the price decline. According to the press secretary, a large amount of red caviar entered the market in September, primarily from Sakhalin, where the fishing season developed favorably. However, in central Russia, average wholesale prices for caviar are 1,200–1,300 rubles ($37–40) per kilogram — lower than in Kamchatka. Major processors are saying that increased imports of frozen red caviar from the United States drove prices down. According to Federal Customs Service data, almost 1,500 tons of this type of caviar (worth over $13 million) had already been imported by August. Eighty-nine percent of the caviar was declared at Customs at $7–9 per kilogram. “In Moscow, that caviar is offered wholesale at 800–900 rubles per kilogram. The Customs clearance price suggests that these are either last year’s stocks, since caviar from the fresh harvest is traded at $18–25 per kilogram at auction, or the importers lowered the customs value and the government had a 170-million-ruble ($5.26 million) shortfall in duties and VAT,” Saveliyev said. Each year, 11,000–13,000 tons of finished, packaged, red caviar worth 28.6–30 billion rubles ($885,500 - $928,800), or close to $1 billion (at processor prices, including VAT), are produced in Russia. Market participants are confident that this situation is the result of a conflict between processors from the Central Federal District and the Far Eastern Federal District. 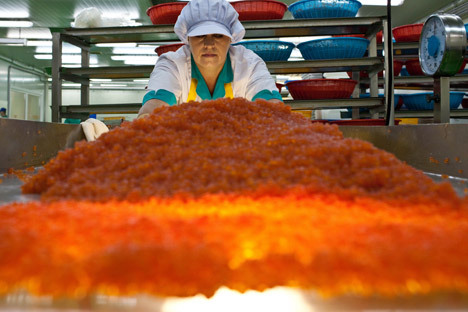 German Zverev, head of the Fisheries and Aquaculture Commission at the Russian Union of Industrialists and Entrepreneurs, said that Kamchatka- and Sakhalin-based producers in the Far East have commissioned a large number of processing facilities and factories on site, substantially reducing deliveries of raw caviar to processors in the central region. “Whereas, earlier, fisherman were forced to sell at least 30–35 percent of raw caviar under the price terms of processors from the European part of Russia, now, they can dictate the terms to processors,” the expert said. This corroborates statistical data. In 2010–2011, supplies of raw caviar to the Western part of Russia totaled around 4,000 tons per year. In 2012, the figure dropped to 1,500 tons. “Processors in the Central Federal District were left with no other option but to buy caviar abroad, and at a low price to boot. Judging by the quantity of imports, they just compensated for the shortage of raw material,” an industry representative said. Yet the conflict might have more serious consequences, both for fisherman and processing companies, and for the industry as a whole. According to the Russian Federal Research Institute of Fisheries and Oceanography, the salmon fishing season kicked off with few fish in both Alaska and Russia, but, by the end of the season, the situation had straightened out. As a result, Alaskan fisherman caught approximately 600,000 tons of pink salmon, with an average caviar yield of about 24,000 tons. “Since there’s little interest in caviar in America, a large amount will be exported — particularly to Russia,” the institute’s director, Mikhail Glubokovsky, said. In the expert’s opinion, this indicates that the price for caviar might decline even further, meaning neither producers nor processors will be able to achieve a satisfactory margin.